Your urine can tell you a lot about your health – including whether you’re properly hydrated. So, let’s look at a few different things you should know about urine color and how you can deduce your hydration levels from that. If your urine comes out very clear, or almost transparent, then that means you’re drinking a lot of water, perhaps even too much. While it’s good to know that you’re properly hydrated, too much water can put a higher strain on your kidneys. They’re already working hard enough as it is – you don’t want to overexert your kidneys. 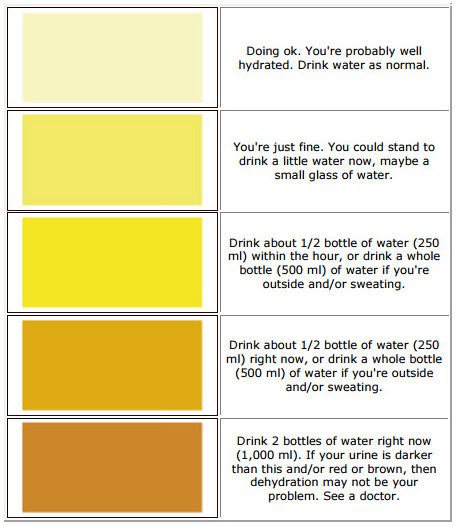 Amber-colored urine is a surefire sign that you’re not getting enough water and need to drink some water immediately. Just like too much water can harm your kidneys, so can too little. Ample amounts of water are one of the most important keys to great health. This entry was posted in Christian Health Food Store, health, Uncategorized and tagged Dehydration, idiopathic, Kange Water, prevent dehydration, urinary Tract, Urine, Urine and Health by Healing, Health and Wellness. Bookmark the permalink.